Your heart is parralel . An unseen diamond in a cell. I lock the diaphragm of love . I reach out like a lost child. So far away from home. Hoping the intrusion of my thoughts. Won't have to be alone. In this forest I search. From the latitude of earth . Across the prime meridian . As low as the vallies . As high as the water rapids. For I refuse to save another. You are my only captive. is as hard as ivory stone. You are sheltered from the wind. That carries along the cold. to reveal my inner love. has fit you like a glove. The briars are sharp . There are bushes with thorns. Your eyes are a torch . A magnet of attraction . my heart is out of traction . in the direction of sin. that has begun to dim. will find you at last. This pursuit in this forest. Is only a dream of happiness. 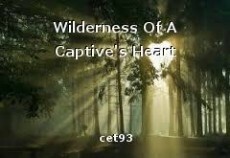 where I lost my captive. .